Valencia Community (now Valencia State) College, Orlando, Florida, 1978, A.A.
Conveniently located in the Herring Building in Seminole County’s government seat, Michael S. Herring, Esquire, a second-generation Sanford attorney, has dedicated himself to providing aggressive representation of the injured, accused and small business interests since 1985. 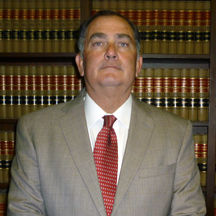 He has represented thousands of clients in civil and criminal courts throughout central Florida and has won at every level of Florida’s courts, including the Fifth District Court of Appeals (Florida) and the Florida Supreme Court. He knows criminal defense, personal injury, and commercial litigation. He has a fair, common-sense approach to representing his clients. In personal injury/wrongful death cases, he zealously pursues the maximum recovery for his clients, while keeping a watchful eye on cost. The client’s net recovery is uppermost. After all, his role is to maximize your recovery, not the other way around. Considered preeminent by his legal peers, Mr. Herring is AV Peer Review Rated* through Martindale-Hubbell. Practicing PERSONAL INJURY and WRONGFUL DEATH law since 1985, Mr. Herring has handled hundreds of personal injury cases and has helped his clients win millions of dollars, (Hart v. ADT Automotive, $2.2 million). He will take on the insurance company refusing to pay fair compensation. He offers FREE, face-to-face or telephone consultations and will advance all personal injury case costs. You pay nothing unless we win. Representing the CRIMINALLY ACCUSED for more than twenty-eight years, Mr. Herring has diligently represented the citizens of Sanford and Central Florida in criminal cases ranging from high profile, complex felonies to the simplest misdemeanors. As a former State Parole and Probation Officer, he knows criminal law and can guide you through your legal complexities ranging from DUI to Drug Trafficking to Organized Fraud. We offer FREE TELEPHONE CONSULTATIONS, reasonable and competitive flat rates, zero interest payment plans and advance payment fee discounts. We accept most major credit cards.